Through the use of advanced construction technology we are now able to offer design build services. We can design everything from parking lots and sidewalks to full site layout. We use Trimble Business Center to offer you a 3D view of proposed design, Google map overlays, design contours, material quantities and much more. It has allowed us to work with customers to understand their vision and deliver them with a project that is on time, on budget, and exactly what they want! We offer fine grading for a wide variety of different grading applications. With a Bob-Cat T-870 and a 96” grader attachment equipped with GCS 900 we can grade almost anything. The grader and Bob-Cat use a Robotic Total Station, Trimble 930, with automatic machine control to bring final grades to a tolerance of less than 1/8”. With this technology we can upload an existing CAD file to follow any proposed design or shoot existing elevations to create our own design. This makes it the ideal machine for preparing sub-grade with complex grade changes such as parking lot sub-grade, final site grading, building pad grading or any other grading project where accuracy is important. We offer laser screeding for all types of concrete flat work using the most advanced and up-to-date laser screed in the world! The Somero S22E laser screed, also the largest screed available, is fully capable of any size concrete job you can throw at it. This machine is capable of screeding 240 square feet per pass, which takes less than 15 seconds. It has a 20′ boom with a 12′ wide finishing head. Unlike other screeds it has a rotating head which allows it to access areas other screeds of this size just couldn’t fit. Also, because of this rotating head, it can screed more complex shapes and sizes and easily pass around columns and other common obstacles which means less hand work! We offer screeding for flat floors as well as 3D paving. Through the years we have had the opportunity to work on a number of exciting and challenging projects. We have gained the knowledge and skills to take on the most demanding concrete projects. Through the use of technology such as our 3D grader, Somero laser screed, and multiple Total Stations, we are capable of completing projects with unmatched accuracy, efficiency, and timeliness. We work tirelessly to focus on the details and understand the demands of modern construction projects. We also understand the importance of having a safe work site. Our people are all trained and certified through a third party OSHA training program. We understand that mistakes cost time and money for everyone. 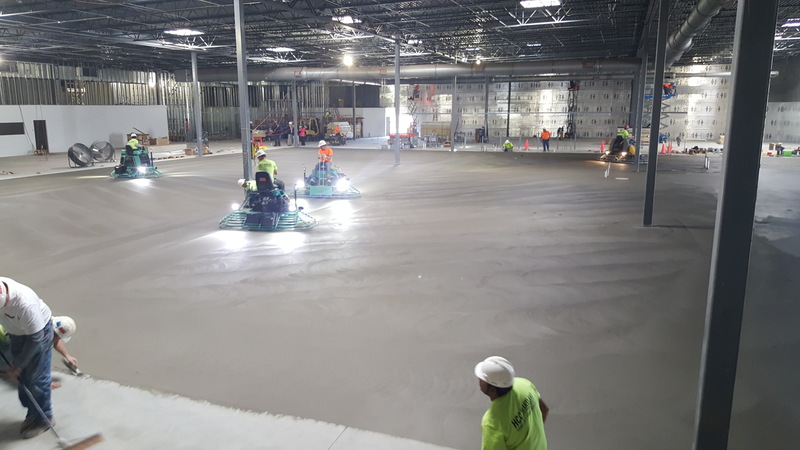 This is why we train and ACI certify our finishers, making sure they have the knowledge, skills and tools to achieve the strict floor flatness and levelness requirements of today’s concrete projects. Technology has provided us many new tools and techniques to complete large paving projects, warehouse floors, parking lots and other concrete projects, at a much faster pace than in the past. Most importantly, we have a great team of talented, hard working men and women dedicated to making sure every job is done perfect the first time! With a vast portfolio of previous projects in our file, we are fully equipped for almost any footing job. We have years of experience in foundation work. Underground work is always treated with equal importance of any job. We make sure that details are not missed and that every bar, plate, or bolt is set where it is supposed to be. We have multiple Total Stations to help with layout, which means our accuracy is unsurpassed by anyone in the industry. Cast in place walls offer their own set of challenges. We are experienced in every kind of wall from 1′ stem walls to 25′ high screen walls. We have experience in ICF walls, loading dock walls, retaining walls, pit walls, and many other different concrete wall applications.